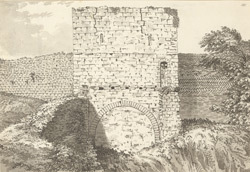 A view in ink of the arch of a gateway towards the north corner of the west wall of Lincoln Castle. The site of an old Roman fort, the first wooden keep was built here in the late-11th century by William the Conquerer and his men. It commanded a view of some 30 kilometres in all directions, and was instrumental in repelling the invasion of King Swein of Sweden in 1070. Thereafter, the castle rapidly expanded to cover some six acres, with an inner and outer bailey. Its 12th- century stone walls still stand.